→Airdyne Pro vs Assault Bike – Which Air Bike for CrossFit? Airdyne Pro vs Assault Bike – Which Air Bike for CrossFit? Airdyne Pro vs Assault Bike: Which is the Best Air Bike for CrossFit? Schwinn is considered the leader when it comes to air bikes. The Airdyne has been a popular model for quite a few years, over time Schwinn has continued to enhance the design through different models, including the Airdyne Pro. While the Airdyne bikes are great, the Assault Bike has a lot of advantages that help it stand out from tough competitors all vying to become the best CrossFit bike. Love them or hate them air bikes give on hell of a workout! 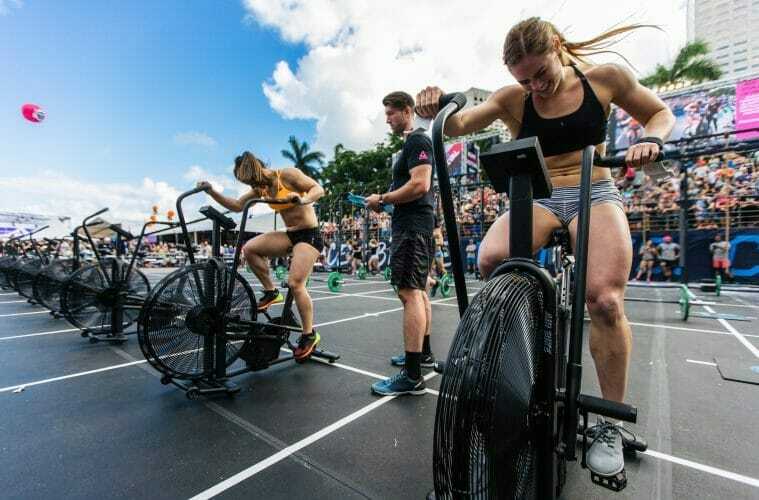 Most CrossFitter's hate cardio, but if you are going to do it you may as well get the best indoor cardio workout, these are the two top choices along with a rower or SkiErg. In fact, you cannot go wrong with either option. However, as you probably only plan on getting one bike, you should compare the pros and cons of both. The Airdyne Pro is the latest air bike in the Airdyne series. The Airdyne AD6 was previously one of the top air bikes on the market. However, it has a few limitations, including a lot of plastic parts that reduce its durability. The Airdyne Pro is a top-of-the-line air bike with all of the features that you would expect, including an adjustable seat for optimal comfort and built-in HIIT programs. It seems that everyone is using interval training, and it makes sense that these air bikes would include programming for it. However, there is much more to explore. When you spend hours on an air bike throughout the week, you want a seat that you can adjust for your comfort. The previous Airdyne models featured seats that could only be adjusted up and down. The Airdyne Pro now allows you to move the seat forward and backward, as well. You also get multiple grips on each handle. There are three different ways to hold the handles, allowing you to choose the grip that feels most comfortable. The grips also feature quality rubber, instead of foam, to prevent slippage and durability. The Airdyne Pro is also designed to provide many years of use. The solid steel frame, along with many metal parts, ensure a durable and stable workout. The pedals are even made of metal. The Pro also features a belt drive instead of a chain drive. The belt drive requires less maintenance and provides a smoother ride. Overall, the combination of metal and durable plastic parts results in a solid bike that can withstand regular use. It should also be mentioned that the plastic parts help to reduce the overall noise level of the Airdyne Pro, making it slightly quieter than the Assault Bike. The Assault Bike is marketed as the air bike that can handle any workout. You can go as hard as you want without worrying about damaging the bike or breaking the chain drive. The Assault Bike also allows you to adjust the seat up and down or forward and back. In fact, the Assault Bike provided this feature before the Airdyne. While this bike has always included a fully adjustable seat for added comfort, some users believe that the seat itself is not very comfortable. However, you can replace it with another bike seat if you prefer. The Assault bike is constructed almost entirely from metal parts, including the chain drive. These features add to the overall noise level of the bike, creating a noisy workout when you pedal. If you live in an apartment or want to workout in the early morning, your neighbors, family, or roommates may not appreciate it. As mentioned, both bikes are made with a solid steel frame. However, the Assault Bike features high-tensile steel for added durability. It is also sealed with a protective layer of powder coating. Even the fan is steel. All of these metal parts result in a bike that feels incredibly stable and secure. The chain drive should last a lot longer than the belt drive found in the Airdyne Pro, which is one of the main strengths of the Assault Bike. However, the chain drive also provides a ride that feels a little less smooth than the ride using the belt drive found on the Airdyne Pro. The primary similarity between the Airdyne Pro and the Assault Bike is their function. Both products are air bikes, and both provide an effective cardiovascular workout. Air bikes use a large fan to generate dynamic resistance. The harder your pedal, the more resistance you get. Both bikes are also built to last. They both feature solid steel frames that support users with a maximum weight of 350 pounds and ensure that the bike will not come apart while you are working out. Basically, these are well-built bikes that should offer years of use, even if you decide to work out every day. These air bikes also include consoles for tracking your workouts. With either option, you can track your calories, watts, and a few other important metrics. An earlier version of the Airdyne lacked some of the metrics that are now included, such as tracking watts and RPM. Thanks to this update, the Airdyne Pro and the Assault Bike are evenly matched in this area. Airdyne vs Assault Bike: What are the Differences? While these bikes possess many similarities, there are a few key differences that may help you make a choice. The console on the Airdyne Pro includes several workouts, while the Assault Bike simply includes pre-programmed settings based on the type of workout that you want to perform. Some people may prefer the workouts that are already programmed into the Airdyne Pro, while others may prefer the simplicity of the Assault Bike settings. The Airdyne Pro comes with a better warranty. The frame is covered for ten years, the parts are covered for two years, and labor is covered for six months. While the frame of the Assault Bike is only covered for five years, the warranty may not be a major deciding factor. Both bikes feature solid steel frames that are unlikely to break. The design of the two bikes is also slightly different. The Assault Bike is almost entirely constructed from metal, while the Airdyne Pro uses a combination of metal and hard plastic. It should be noted that the Airdyne Pro includes more metal than the previous Airdyne models. The primary difference between the all-metal Assault Bike and mostly-metal Airdyne Pro is the noise level and the durability. The Airdyne Pro is the quieter of the two bikes, while the Assault Bike may be slightly more durable. Some people also believe that the Airdyne Pro is the more comfortable bike. While both bikes feature fully-adjustable seats, you can now adjust the angle of the Airdyne Pro seat, offering more options for getting just the right fit. Conclusion: Which Air Bike Should You Choose? The Airdyne Pro and the Assault Bike are two of the highest-rated air bikes for CrossFit available. The manufacturer of the Airdyne Pro has a history of producing quality exercise equipment, and their years of experience are evident in the design of this air bike. However, the Assault Bike is also well-built and just as capable of delivering an exceptional cardio workout. Several of the advantages that the Assault Bike previously had over the Airdyne bikes are no longer valid. The Airdyne Pro includes many updates that help it to match the Assault Bike. Both bikes now allow you to adjust the seat up and down or forward and back. Both bikes also allow you to track watts and RPM. If you need to choose between these two bikes, you should consider which features are more important to you. If noise is a factor, you may prefer the Airdyne Pro, as the belt drive and hard plastic parts help provide a quieter ride compared to the Assault Bike. Many people also prefer the smoothness of the belt drive over the chain drive found in the Assault Bike. If you are mostly concerned with durability and stability, the Assault Bike has a slight edge over the Airdyne Pro. However, it is close call. The complete metal construction of the Assault Bike adds to its solid design, providing an air bike that people of any fitness level can enjoy without worry of breaking the machine. In the end, the Assault Bike and the Airdyne Pro are the two leading air bikes currently available. For us it is the Assualt bike that just about takes the title as the top Crossfit bike to buy.